How much should luxury cost? As much as someone who wants to wallow in it is able to pay for it. Pricing of this type of products is a bit like an auction of works of art: their real value is usually hard to measure, so it is determined on the basis of the highest selling price of similar items. Luxury product on the one hand is capital investment, on the other it is prestige - and that for many people is a priceless combination. 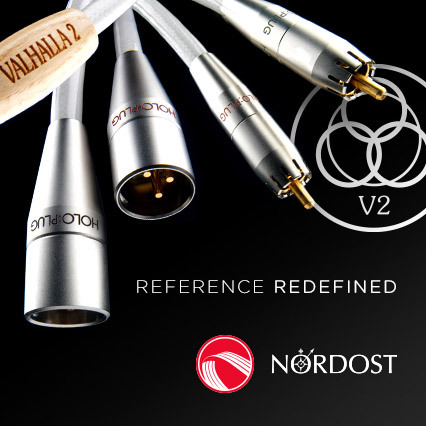 In the world of audio we deal over and over again with luxury products. And I don’t mean only some astronomically expensive components, speakers or cables, but basically any audio product. Audiophilism is a part of music industry focused on improving only one thing, and an attempt to bring it to perfection: the sound. Like every specialized activity, it costs money. Hence, even an amplifier for three hundred bucks is the pinnacle of luxury for someone who just bought for the same money an entire home theater system with a Blu-ray, a multi-channel receiver, five speakers and an active subwoofer. And you must to take into account that you still need to buy a source for that amplifier, such as a CD player, a pair of speakers and some cables. So now we are talking about a thousand bucks. Spent on audio equipment. That really is a lot of money, no matter how we approach it. Spending money on luxury products, one might even say excess luxury, is actually a matter of one’s decision, not of capability. Whether we do or do not have the money, as long as we really want that something, our "yes" is determined solely by our attitude. To people not into audio, three thousand bucks spent on an audio system seems a very large, not to say a gigantic amount of money. As I said – they're right. Not entirely, we should add, since as usual it is a matter of proportions. If you happen to read reviews in specialist audio magazines, if you visit audio shows, or at least have friends touched by this sweet madness, you probably already know that we are able to spend just that much on a single cable, an anti-vibration platform, or even on a CD album (Crystal Glass, see HERE). And that IS crazy. But no less fantastic at the same time! 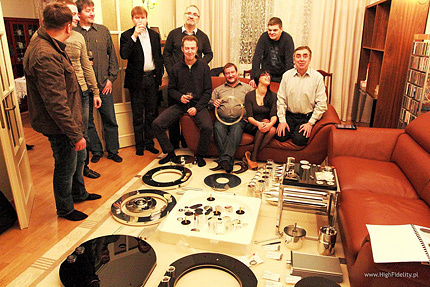 OK, so how about this: 130,000 euro for a turntable. Without a tonearm or a cartridge. 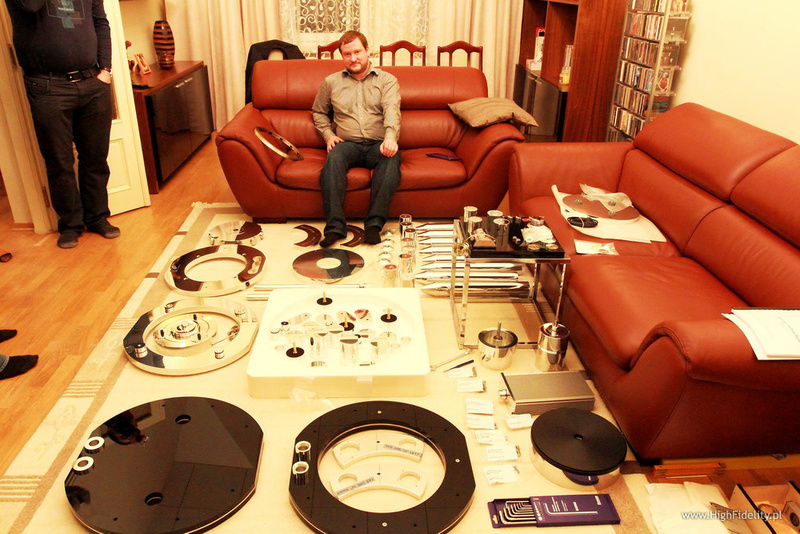 That's correct: over 500,000 Polish zlotys for the turntable to which you need to add another tens of thousands! That is the cost of the Artus FMD from Transrotor, without tonearms or cartridges. On their website, the Germans dedicate to the turntable only a few lines, listing cardanic (gimbal) suspension, aluminum and acrylic build, Transrotor Free Magnet Drive (FMD), special power supply, and platterweight. Not that much. Modest amount of attached pictures (four) does not help much in figuring out what we're dealing with. Even the basic size and weight information: 55 x 55 x 120 cm and 220 kg accordingly, allows only a superficial familiarity with the matter – all we can conclude is that it is not just another turntable, but rather a really big drive system. Wojciech Pacuła: Who and when designed the Artus? Dirk Räke: The Artus was designed by my father (Jochen) in 2005. The first unit was manufactured a year later. How many parts does it consist of? Counting everything - from 180 parts. Many of them, however, are made of even smaller components. What were its main design objectives? It was actually the use of the cardanic suspension of the chassis, the large mass and FMD drive, exactly the same elements as in the Argos, which you once reviewed. How many of these turntables sold out? 17 worldwide, of which three in Europe, including one in Poland. Who is manufacturing the aluminum and acrylic components for you? We co-operate with a number of specialists, each in a given area. Some of them cope better with large metal parts, and others with small. We have been working with these companies for more than 10 years and we have been very happy with them. All the Artus components are manufactured within 130 miles from our headquarters. Any additional word from you? The demonstration in Krakow was very interesting, it was really fun and I had a good talk with audio fans; I had a pleasure to see a great record collection and a nice house! I’m not sure if you recall that, but we have already reviewed in "High Fidelity" a product of a similar class, also from Transrotor, the Argos (see HERE). The cost was similar: 600,000 Polish zlotys. Also, the basic design concepts were similar: drive integrated with the base, leveled with cardan suspension and a heavy weight, with magnetic coupling between the sub-platter which is driven by the motor and the platter spinning the vinyl record; with no direct contact between the motor and the record. For many, however, the problem was its modern look, reminiscent of Art Nouveau, geometric household products and furniture. The Artus, which is the subject of the current review, looks much more "classic" in comparison. It has six legs, its outline resembles a truncated ellipse, and the platter is fully visible. The turntable came to Krakow for a presentation at Tomek’s house, who is member of the Krakow Sonic Society. But it was not another KSS meeting - when I was leaving around midnight, there were still new guests arriving. It is not very often that you get a chance to see this type of turntable for yourself - there are 17 of them all over the world, with vast majority located in Asia. 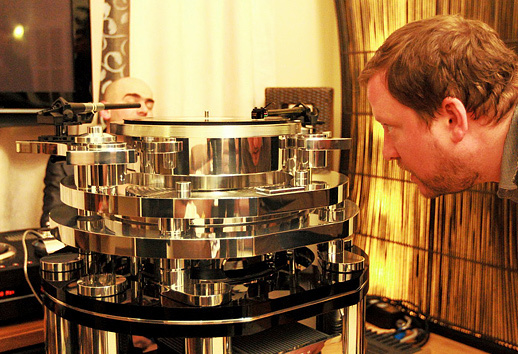 What made the meeting even more attractive was the fact that the Artus was assembled right in front of our eyes, personally by Dirk Räke, the son of Jochen, the owner of Räke Hifi/Vertrieb GmbH, the company carrying the Transrotor brand. Jochen Räke’s adventure with turntables began in 1971: for the first four years he was the sole importer to Germany of the British Transcriptor turntables. At one point, inspired by their original design, he decided to design something similar yourself. The result was the first Transrotor AC turntable. Manufactured in J.A. Mitchell factory, ten years later it fell the victim of the expansion of the CD format. Mr Räke had to start his own factory in Bergisch Gladbach, Germany. It was there that the Artus FMD was built. Jokes about the Poles in Germany are a plenty. While we are a little guilty ourselves, it is also a result of an innate aversion to strangers, present in every nation, and probably some other factors as well. Similarly, there are loads of Polish jokes about the Germans, especially popular during the People's Republic of Poland era. But I have not heard a single joke about a German working for a Pole. And actually it looked like a film made on such joke script: Dirk, a fantastic guy who I’ve known for years, was working for five hours in a Polish home to assemble the turntable for us. He did everything by himself, because he did not want any of the components misplaced or gone missing. Not because he dealt with the Poles (another joke), but because the sheer complexity of the product design, although seemingly simple, is unbelievable.